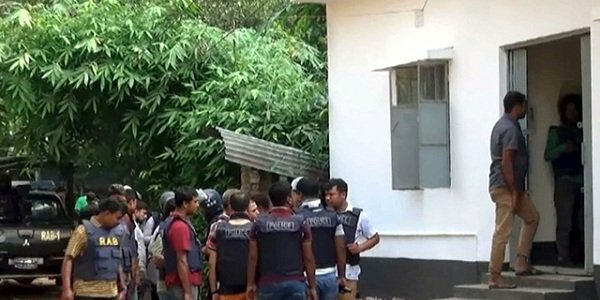 Dhaka – The law enforcements have disclosed identity of six out of 12 suspected militants killed in anti-extremist raids conducted Saturday in central Bangladeshi districts of Tangail and Gazipur, police said on Sunday. The suspects were killed in gunfights that erupted in four terrorist hideouts where the members of the Jamaatul Mujahideen Bangladesh had been holed up for months. Abdur Rahman Ainal (30), an activist of the banned militant outfit, killed after he jumped from a four-storey building in Ashulia during a raid conducted by the Rapid Action Battalion on Saturday evening. He was the financer of attacks in Bangladesh, police said. Police Masudur Rahman said three of the nine suspects killed in Gazipur were identified as Akash, a regional commander of JMB, Rashedul Islam and Touhidul Islam. Atikur Rahman and Sagor were killed in Tangail raids.